The Train by Romare Bearden, 1975. Taubman Museum of Art, Roanoke, Virginia, gift of the 1995 Collectors Circle, © Romare Bearden Foundation. The artist Romare Bearden once said: “I try to show that when some things are taken out of the usual context and put in the new, they are given an entirely new character.” Like his art, Bearden’s life was about changes of context. Born in North Carolina in 1911, he moved to Harlem with his family at age three, part of the great migration of African-Americans to the North in the early twentieth century. Blessed with a questing curiosity, Bearden developed his art under influences that ranged from cubism to the work of Mexican muralists such as David Alfaro Siqueiros. Brass Section (Jamming at Minton’s) by Bearden, 1979. University of Richmond Museums, Virginia, museum purchase with funds from the Louis S. Booth Arts Fund, © Romare Bearden Foundation, photograph by Taylor Dabney. 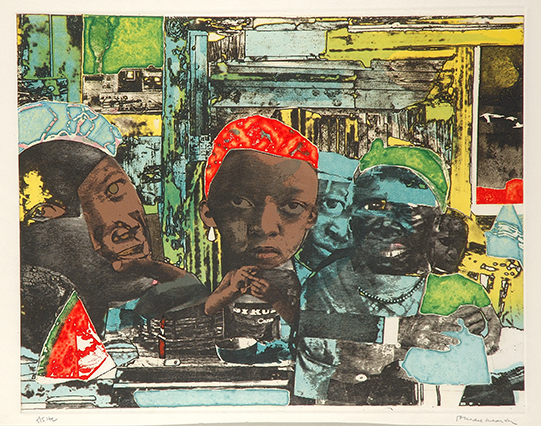 A centerpiece of the exhibition is The Train, a 1975 hand-colored etching that is a riff on a 1964 collage—the medium for which Bearden is best known. It is part of a series in which, Moorefield says, the artist “focused on images you would see if you were traveling on a train, specifically the small towns you would see in the South.” There’s no better metaphor for Bearden’s ever-changing perspective on life and art.